where vid = RT/p is the molar volume that the gas would have were it ideal. By the definition of Z, the compressibility of an ideal gas is unity. Nonideal gases, even the same one, can exhibit values of Z greater or smaller than unity, depending on the pressure and temperature conditions. 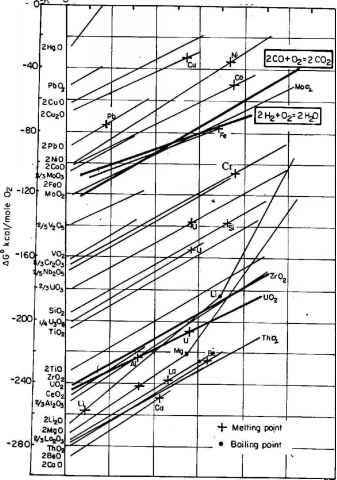 As an example, Figure 2.3 shows the compressibility of nitrogen as a function of pressure for a number of temperatures. Figure 2.2 is a simplified version of Figure 2.3. The complexity of the curves in Figure 2.3 is a result of the interplay of the repulsive and attractive intermolecular forces. Three main points emerge from Figure 2.3. 1. Ideal behavior is favored by high temperature and low pressure. Ideality is reached at a higher gas pressure at 300 K (~7 MPa) than at the lower temperatures (~1 MPa at 200 K). 2. Point A at 2 MPa and 130 K represents a state with negative deviations from ideality (Z < 1). The reason for this behavior is the attractive forces between N2 molecules, which act to contract the gas to a volume smaller than what it would have were it ideal.